Sen. Bernie Sanders is losing the delegate contest to become the Democratic presidential nominee, but he's winning another major battle: According to a Gallup poll published Monday, his signature plan for overhauling the national health care system is the most popular health care plan belonging to any candidate remaining in the race. During the survey, Gallup described three different proposals on what should be done with the Affordable Care Act, the 2010 health care reform law -- but without mentioning the candidate affiliated with the proposal. 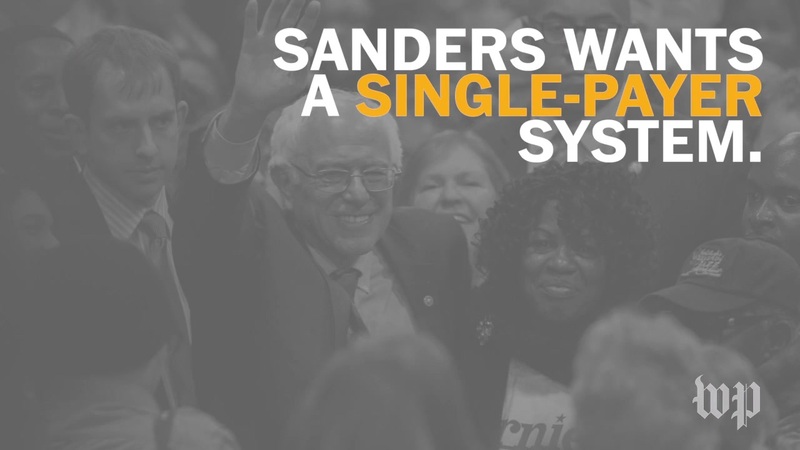 The most popular scenario was one in which the ACA was replaced with "a federally funded health care program that provides health insurance for all Americans" -- a plan that describes Sanders' ambition for reforming the health care system. Sanders' proposal garnered support from 58 percent of respondents, with 37 percent opposed. As can be seen in the chart below, the other two scenarios -- keeping the ACA in place, which describes Hillary Clinton's position, and repealing the ACA, which captures presumptive Republican nominee Donald Trump's -- trailed by many points in favorability. Favoring one plan wasn't mutually exclusive with favoring another. Nearly 60% of Democrats and Democratic leaners said that they favored both the proposal to keep the ACA in place and replacing it with a federally funded health care plan. In other words, they backed both Clinton's and Sanders' approaches to health reform. The key to understanding the popularity of Sanders' plan is that it garners significant support from Republican and Republican-leaning individuals. 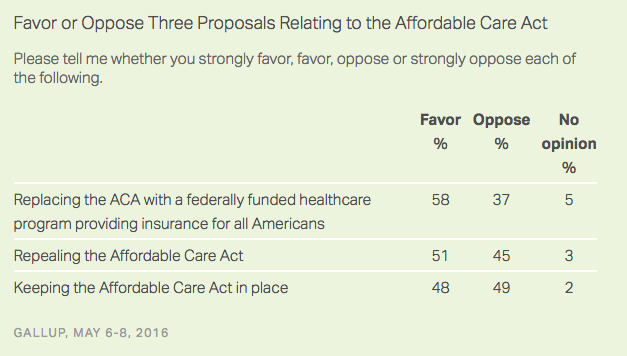 An astonishing 41 percent of them favor the idea of replacing the ACA with a federally funded plan. That's counter-intuitive, given that historically most Republicans have opposed the ACA based on the (largely mythical) claim that it constitutes a government takeover of the health care system. So why would they support a proposal that would enact what they claim to be terrified of? One explanation is simply that people aren't entirely clear on what "federally funded" means, and responses might have looked a bit different had those words been replaced with "government-run." While much of the public has been debating their stance on the ACA for years, they aren't necessarily well-versed in the details of how those policies actually work. Most people likely look at the issue of the ACA through the broader prism of whether or not they like President Barack Obama and recent Democratic Party policies in general, rather than through complex questions of whether a particular health care model comports with their general worldview. In this sense, conservative support for a Bernie Sanders-type plan isn't as much an endorsement of his plan as much as it is a ham-fisted vote of no confidence in the status quo. Competing proposals to "just repeal the ACA" plan and to replace it with a publicly run health care system share one thing in common: repealing the current system. Given that the ACA has failed to deliver benefits for many citizens and that outsider political candidates promising to shake up the establishment are on the rise, that kind of inchoate desperation for anything different shouldn't be entirely surprising.